When I was running my own start-up company back in the year 2000, I experienced first-hand that a partnership between a small tech company and a giant corporate can be challenging. One of the key reasons for this is the different perception of time. For a start-up one month is an eternity. For a corporate one month is too short to make any strategic decision, let alone to implement a new way of working or develop a new service towards a customer. However, once a partnership has been established the value for both parties can be huge. The corporate can introduce new services and/or improve internal processes at a faster pace than before, and the start-up can introduce their service at a global scale faster than they could ever do on their own. Based on these experiences I developed a passion to make innovation partnerships work and I have played Cupid in Innovation hundreds of times. Connecting young innovative companies to larger organizations looking for solutions. And I have learnt some lessons for sure. Lessons on when it does work. And lessons on when it does not work. I want to share with you some of these lessons. And share a dream for broader open innovation approaches to tackle some of the world’s global challenges. 1. No real business opportunity (improving client experience or significant cost reduction). 2. No clear owner for the collaboration and/or no budget available for experimenting or development of tailor solution. 3. Differences in expectations and speed of decision-making between smaller and bigger company. 4. Start-up / Scale-up solutions not mature enough for global scaling. Unfortunately, well performing collaborations are a minority at the moment. Even though it sounds so logical. The big have the resources (money, people, market access, etc) to scale a service globally and the small have great innovative services that can make a massive impact. 1. Clear direction. An innovation approach that aligns with the overall strategy of the organization. 2. Strong innovation leader with top management support. This can be a business owner or an (open) innovation team. 3. A well-defined business challenge. 4. Mandate and budget for piloting or joint development, and clear definition of criteria for scaling the initiative if agreed metrics are reached. Open Innovation Programs with Impact. 1. Set up a strong team with drive and ownership to lead the innovation agenda. 2. Define an open innovation program that addresses one or multiple strategic goals for the company. 3. Collect Innovation Challenges from key business owners in your own organization, or even at your (business to business) clients. 4. Get the very best (tech) companies from around the world to apply for the challenge. Don’t expect them to find the challenge. Make sure your research team or research partner finds them and invites them to join. 5. Select the best fitting partner based on a intensive selection process and shape the collaboration in detail in a pressure cooker workshop to make sure both organizations know each-other’s goals well, and create a realistic plan to prove the value of the collaboration. 6. Run a joint development / pilot project and measure the outcomes in line with the objectives agreed in the collaboration shaping workshop. 7. Make sure the innovation program is visible for the outside world. Being known as an innovator has a huge impact on your market position, stock market valuation, (employer)brand value, employee engagement & retention etc. When the program is executed the right way the Return on Investment for the Open Innovation programs is huge. Moving the needle in just one of the value drivers in the model below will cause a tremendous ROI on Innovation – and typically at least 3 to 5 of the metrics are impacted by the program – leading to an even better return. 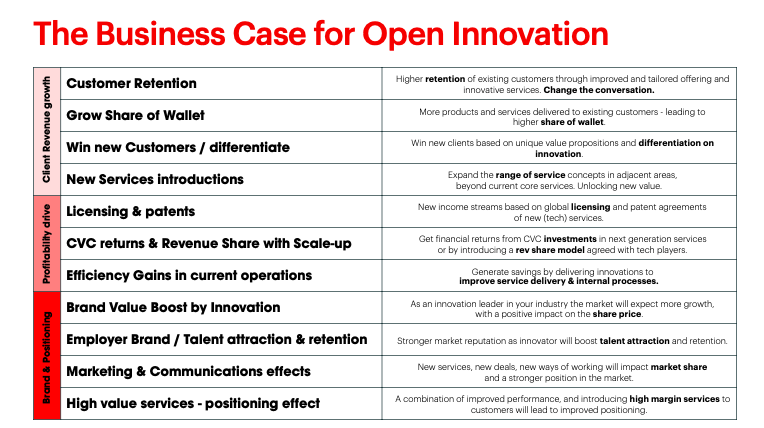 In the model below, I have summarized some of the common value drivers for the open innovation programs. For each organization there may be several additional value drivers that can be identified. More and more companies run open innovation programs in close collaboration with partners in the value chain (suppliers, distributors, consultants, etc) and some even with their key business clients. This helps to build relationships with these key partners and helps accelerate the impact of the innovations that are implemented. Very few successful innovation programs have industry peers (or ‘competitors’, if you will) collaborating for innovation. However – some of the world’s global challenges may call for just that: a group of industry giants coming together to drive Impact. This vision really triggered me. The opportunities are endless. And the need for change is urgent. What if leading Fast Moving Consumer Goods companies would get together and look for the best solutions to combat plastic waste? What if leading technology players would collaborate to get the next billion people connected? What if leading Agri-Food companies would collaborate to make healthy food available for everyone? What if leading energy companies and cities could collaborate to develop solutions for the energy transition? What if global companies would collectively scout for technologies to make clean water available everywhere and for everyone? The impact for our planet would be immense. And the economic value for the companies involved too. These are the kind of challenges we like to take on at nlmtd. One challenge at the time. Let me know if you are interested to join our mission! At the Global Entrepreneurship Summit 2019 these key challenges around Food, Energy, Water, Health and Connectivity will also be the core. Entrepreneurs from around the world are invited to share their ideas with government- and corporate leaders. If you want to be part of this event in The Hague in June 2019, you can apply here. And what happened to my start-up you may think? Well, when the (first) internet bubble busted in the year 2003 bigger companies did not trust any start-up service any more. Our growth stagnated and that pushed us to sell our company to a global Digital Agency network. This company was trusted by global clients, and therefore could continue the growth of the client portfolio. They continued to deliver these digital services to their key clients. And after a while I moved on. Dedicated to be a matchmaker for open innovation programs. Because I truly believe that Innovation is done better – and with more Impact – together.